Oxford Women’s Health will this year celebrate a decade of working with Otago and Southland women, from satellite clinics across the lower South Island and weekly clinics at Southern Cross Hospital, Invercargill. “Ten years ago, we started providing gynaecology consultations and surgery in Southland and now feel we are a greatly appreciated part of the Otago/Southland community,” Oxford Women’s Health general manager Catherine France says. “Women at every age and stage of life come to see us for advice and treatment. Issues range from endometriosis and heavy bleeding to pelvic pain, incontinence and menopausal problems. However, some women are still waiting too long to address their health issues. 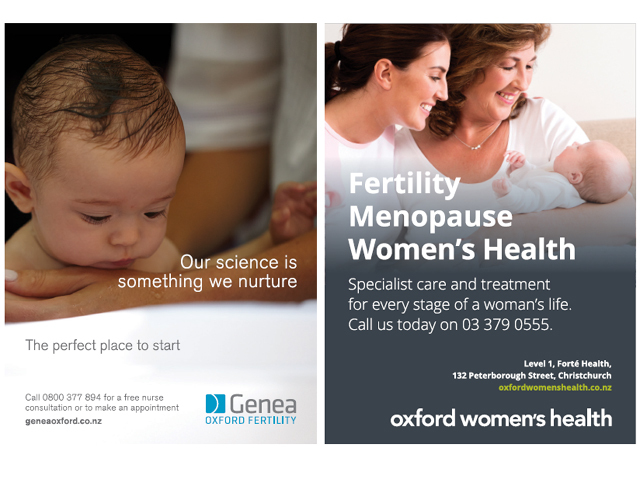 Genea Oxford Fertility’s most recent patient satisfaction score, from January to June 2018, was an outstanding 98 percent. Oxford Women’s Health has a wonderfully caring team of nurses and doctors. To get in touch with them, ask for a referral from your GP or simply call for an appointment.